Everyone knows that if you’re going on vacation, you need to top up your pre-vacation tan. Sure, you’re going to lay out in the sun during your vacation, but you can’t be too pale before you do that, can you?! Absolutely. This blonde bombshell obviously wanted to make an impression for her Spring Break adventure, but we have a feeling that she went a little overboard. Although the makeup really is something that needs to be seen to be believed, it’s fair to say that the orange tan offers a distraction from the pale pink lips and the tiny eyebrows. 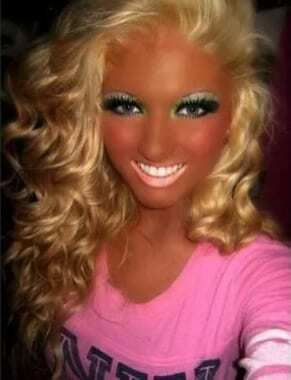 We never thought we’d say this, but that is way too much tan. Did you even go on Spring Break if you didn’t take a photo every minute and upload it to social media? 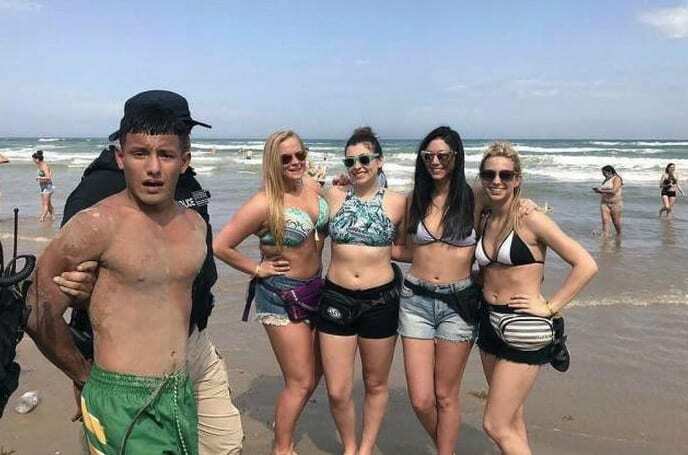 This girl was in the middle of her Spring Break photo shoot when the cameraperson realized something bad was going to happen. Although she may look happy on the left, that’s because she couldn’t see the giant wave coming up right behind her, ready to crash any moment. Unfortunately, she was soon made aware of the wave. After all, we all know that what goes up must come down. If you’re single and ready to mingle, Spring Break can be the perfect time to bust out your chat-up lines and have a vacation romance. 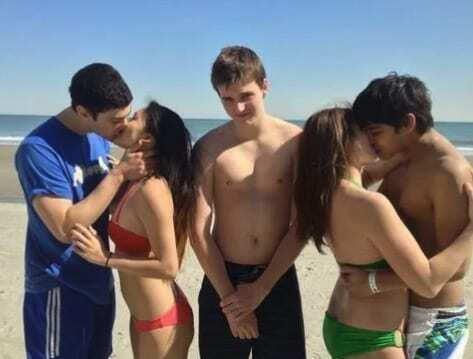 While two of the three boys in this friendship group managed to find a few lucky ladies to spend their Spring Break with, the odd one out had to deal with being the piggy in the middle and listening to the smooches of his best pals. He doesn’t seem too pleased about this fact, but we have faith in his romancing. Next time, ey? There’s nothing better than spending Spring Break in a beautiful location with your best girlfriends, and these ladies thought they were living the life of luxury when they descending on this Spring Break beach. They thought they would capture their epic vacation in an equally epic photo that showed them all jumping for joy – but they didn’t realize that they had unconsciously added a new member to their group. Yes, a distant photobomber decided to get in on the action, and it seems he can also stand on water. That’s pretty impressive. If you’ve ever left your mom and dad to go on Spring Break, you were probably given a whole host of rules to comply with. You were told to “Don’t do this” and “Don’t do that” and you only really listened to a few of them. 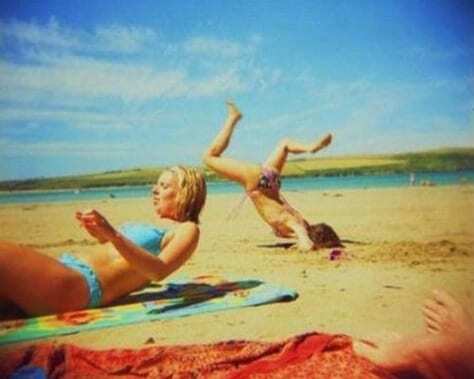 However, this girl is probably kicking herself for forgetting her mom’s number one rule: “Don’t drink and handstand, because it will end in disaster.” Sadly, this girl didn’t quite realize what her mom meant until her nose came into contact with the hard sand. Although college students make the most of the frat parties, they do everything they can to ensure that their grades don’t slip. They wake up early for 9 am lectures, they spend most of their free time in the library, and they often skip parties for all-nighter studying seshes. So when it comes to Spring Break, it’s about time they deserved a break. Luckily, this girl knows exactly how to chill out after a long semester, and is letting her hair down for a little bit of Spring Break fun. We don’t blame her! Now, we’re no scientists, but we have a funny feeling that water and electronics don’t necessarily mix, unless they’ve somehow created a waterproof laptop without us realizing. While we’re not completely sure what this girl is doing, we can only assume that she told her parents she was going on a working Spring Break vacation, where she would totally be working on the beach every day. Her friend went to take a photo as evidence, before realizing that the tide was quickly coming in. There was no way to save the laptop. With more and more students descending on Spring Break locations every single year, companies and brands are doing everything they can to make as much money as possible. Because of this, it’s cheap drinks all around! 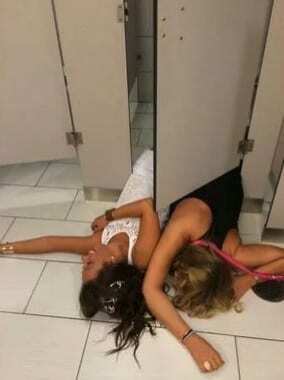 These ladies took advantage of the drinking deals at the bar, but forgot about the fact that dancing and drinking do not mix. Sadly, she had to say a heartbroken farewell to her beer as she watched it fall in slow motion out of her hands and onto the sand below where it would be lost forever. So sad. A huge number of teenagers and young adults in one place means just one thing; competition. With people battling it out to be the king and queen of Spring Break, college students from across the globe try and do everything they can to ensure that their outfits are the best. The men try and outdo each other with their colorful shorts and their vests, and the ladies try to find the coolest bikinis around. Well, this guy did things a little differently. 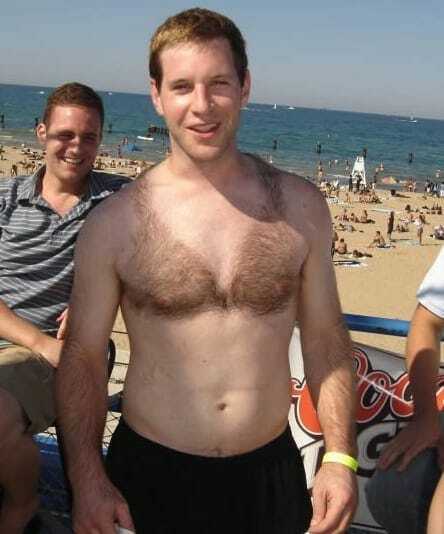 Say hello to the winner of the hairkini competition! Although we like to choose our friends with care and consideration, these rules go out of the window when on Spring Break. The aim of these few weeks is to make as many friends as you can from all over the country and from all over the world. That’s exactly what these ladies did, and they even created their own little hand symbol to showcase the love they have for each other. While they might not remember who they are in the morning, the ladies still have a bond for life thanks to their Spring Break adventures. No matter where your Spring Break takes you, you will always find that someone at your destination will bring something ridiculous along with them. It may be a blow-up doll, it may be a chicken, or it may be a pair of nunchucks. While we have no idea why anyone would want to take nunchucks on Spring Break, we have a feeling that this woman wished she had taken none-chucks to the beach with her. Nevertheless, she has to live with that memory… And a nasty bruise on her face. If you’re planning your own Spring Break right now, there is one thing you need to remember, and that is to take lots and lots of photographs! There’s a high chance that you won’t remember a lot of what happened during your Spring Break experience, so it’s good to have photo evidence of all of the exploits you got up to. 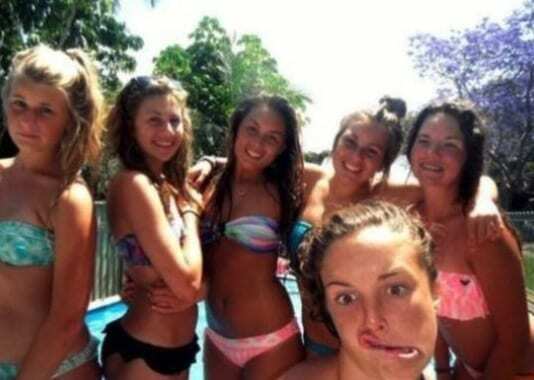 However, you might want to practice your selfie face, because the girl in the bottom right didn’t do that – and you can kinda tell. You know, just a little bit. One of the best things about Spring Break is that you can literally wear anything and get away with it. Want to wear a bikini for the whole week? Go for it! Want to wear a giant sleepsuit? You might get a little hot, but we’re not gonna stop you. Want to wear a Batman mask? Sure thing, Batman! 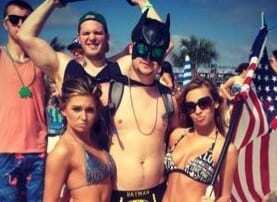 Fancy dress is a huge part of Spring Break, and college students from across the country will stop and take photos with you if you’re dressed up. These ladies obviously used the Bat Signal for a photo with this guy. Would you like some aloe vera for that burn? Because that actually looks pretty painful. 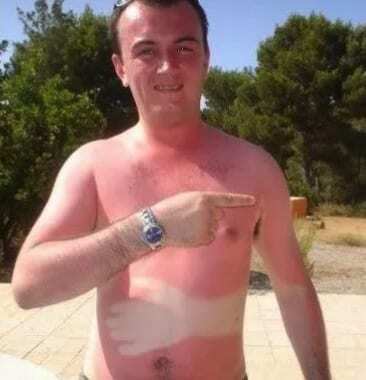 While we know that this sunburn looks absolutely ridiculous, we have to give this guy credit, because he is styling it out beautiful. 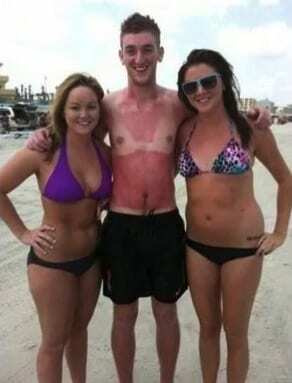 We’re not sure how he came to wear a bikini top and why he didn’t wear sunscreen… But he did, and he’s rocking it! He’s taking the whole thing in his stride and laughing it off. That’s what Spring Break is all about, because if you can’t laugh at yourself, who can you laugh at? Although most college students take to their lecture halls after graduating from high school, there are some mature students who attend their classes later in life – just like this guy. 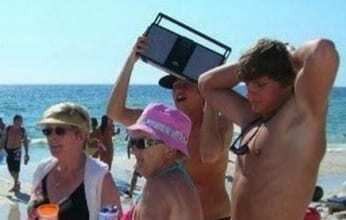 While he knew that he was much older than his classmates, this grandpa didn’t want to miss out on a true college tradition, so followed his friends for Spring Break. It seems as if he’s having the time of his life with these ladies on his arms, so we can’t imagine he’s regretting his decision to skip his aqua aerobics class and go to Cabo instead. There’s a reason why so many students descend on Spring Break locations every year, and that’s because they have a good giggle with their mates. They don’t have lessons to worry about, they don’t have textbooks to revise, and they don’t have to worry about being an adult for weeks. It’s time to have fun! These ladies took this notion as gospel and decided to make the most out of their Spring Break. They had a giggle with their girlfriends, and they drank to their heart’s content. What more could you want? No matter where you go in the world, there will always be someone who wants to photobomb you. It’s just the way it is. 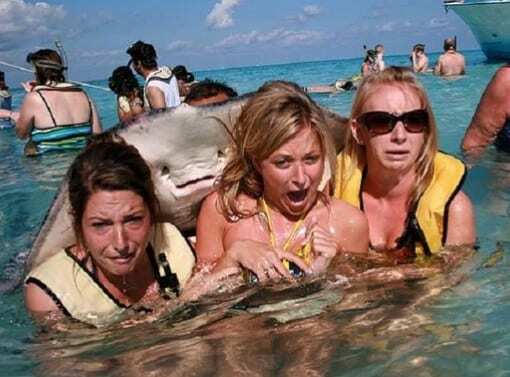 Although these ladies thought they would be safe in the water during their Spring Break trip, their good vibes soon became nonexistent – especially when they realized they had a stingray on their backs. Yes, it’s not every day a stinger comes up and says hello, and we can imagine they were just a little scared of what was going to happen to them. At least he looks pretty friendly, huh? With so much to fit into your Spring Break experience, it’s important to make sure that you’re ready to go from day to night, and from beach to club, if you can’t make it back to your hotel room. While we do have to question this woman’s choice to wear heels on the beach, we kinda get where she’s coming from. She’s more than ready to get crunk in the club with those heels – that’s if the designer red soles haven’t been eroded by the salt. Fingers crossed they haven’t. The more you look at this photograph, the weirder it gets. Trust us. One of the main reasons we love Spring Break so much is that it brings people from all walks of life together. You meet people from the other side of the country, and you even meet people who are downright weird – just like this gymnast! With an insane ability to stretch her body and contort into all different shapes, this girl had Spring Breakers wondering what the heck was going on, but she also made a lot of friends. Spring Break is a chance for college students across the country to follow their hormones and kiss a few frogs – but it seems the Spring Break fever doesn’t only affect humans. 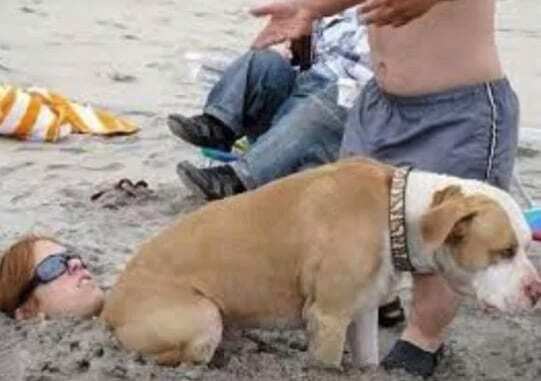 This Spring Breaker was just trying to enjoy her time on the beach and her time away from her studies when she realized that her photograph was being bombed by a few dogs. Although we’re sure that people would have loved to give them privacy, the dogs don’t seem to mind everyone watching. Whatever floats your boat, doggies. If you’ve ever experienced college life, you’ll know that you can’t go anywhere without having drink thrust in your face. Of course, we mean this metaphorically, because the bars and clubs around your student town offer cheap drinks and opportunities to have the best night of your life on a budget. However, it seems the person holding this bottle took this notion a little too seriously. 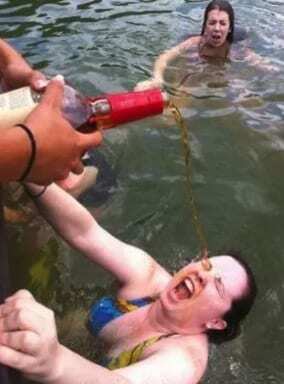 Either that or she has really bad aim and was trying to get the drink in her mouth. No matter what, this is an epic fail. Spring Break can really take its toll on the body. You survive off very little sleep, very little food, and a heck load of booze – and it starts to get to you after a while. These two women were dancing the night away in the club during their Spring Break experience, but decided to take themselves somewhere safe for a little lie-down. After all, they still had the whole night ahead of them! While we don’t agree with their choice of resting place, at least they’re safe and sound in the restrooms. These lovely ladies were enjoying every last second of their Spring Break when their friend was taking this photo, and they couldn’t wait to get back home and show their parents just how responsible they had been. However, we have a feeling that this photograph probably went in the trash when they had a second look at it because this guy isn’t exactly setting the greatest tone for their vacation. Well, at least it wasn’t the ladies who were getting arrested! There’s always a silver lining to every bad situation, right? Because Spring Break celebrations happen across the country in various different locations, many unsuspecting vacation-goers find themselves mixed up in the loud and lavish lives of Spring Breakers. While some are disgusted by the lewd behavior that goes on on the beach, there are others who take the whole thing in their stride and get involved themselves. That’s exactly what these old dears did when they stumbled upon these jocks. Instead of turning away and finding a new piece of beach, they decided to get involved! After all, they couldn’t turn down a dance. Spring Break is one of the only chance teenagers, and young adults have to horse around and truly let their hair down. They can have fun with their friends, they can let loose away from their parents, and they can create memories that will last a lifetime. Yet, it seems as though this guy took this notion to the extreme and decided to literally horse around. 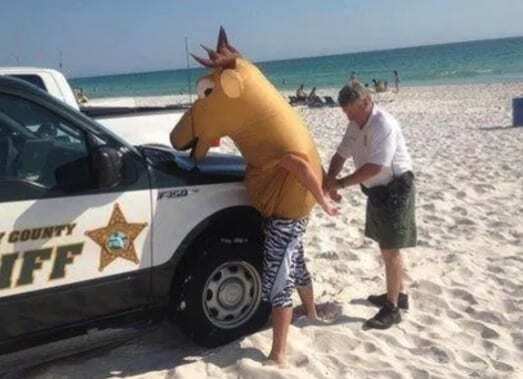 Sadly, the county sheriff wasn’t too happy with his actions and decided to take him to the stables for questioning. Oops, we mean the station. Although we all like to believe that humans rule the roost, it’s fair to say that sometimes us humans get in the way of monkey business. As much as this woman tried to enjoy the sea during her Spring Break vacation, she soon realized that she was stepping into monkey territory – and they weren’t ready for visitors. Unfortunately, she didn’t exactly do herself any favors, as we all know that you should never go into a sea full of monkeys with a handful of bananas. It’s just common sense really, isn’t it? Nowadays, you can’t go on vacation without taking an inflatable of some kind. You might follow the celebrities and grab your very own swan, or you might choose one of the many other options on offer – like a flamingo! It seems the store had run out of inflatables when this guy entered the store, but he wasn’t going to take no for an answer. So, he decided to make do with an inflatable doll – and it’s kinda weird. Either that or this is his brand new girlfriend. Each to their own. No Spring Break would be complete without crowds of people, flowing drinks, live music, huge stages, and people sitting on each other’s shoulders. 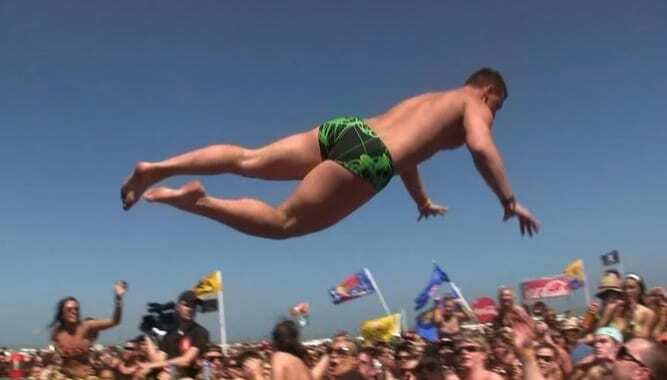 Yet, no stage would be complete without a stage diver, and those on their Spring Break in America are more than happy to take one for the team and try out their diving skills. We have no idea whether the crowd below caught the flying man as he attempted to crowd-surf, but we really hope they did. You know, for the sake of his face and his academic future. In 2010, these lovely ladies and gentlemen were living it large on their Spring Break and having the time of their lives. Luckily, Burger King had managed to move one of their restaurants onto the beach so that hungry party-goers could eat their burgers, fill their stomachs, and spend their money – and it’s fair to say that they made a huge amount of money. 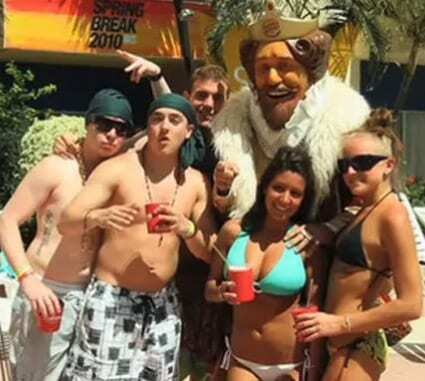 To remind themselves of their yummy burgers, this group of revelers decided to take a selfie with the king himself. That’s one for the photo album.